Janet Louise Yellen, also known as Janet Yellen, is a renowned American economist. She was nominated by President Obama to succeed Ben Bernanke as a Chairwoman of the United States Federal Reserve. She is the very first woman to have held the position as the Chair of the Board of Governors of the Federal Reserve System until 2018. 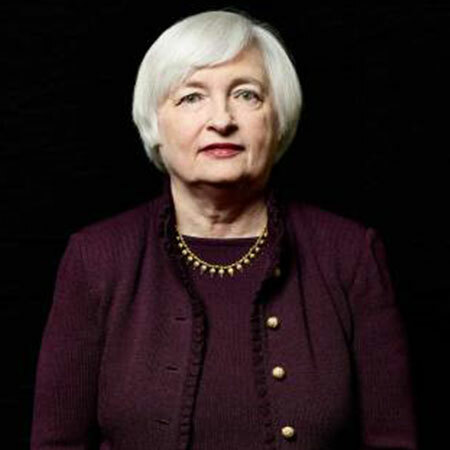 A native of New York City’s Brooklyn borough, Janet Yellen was born on 13th August 1946 to a Polish Jewish family. Her father was a family physician, who served on the ground floor of their home. Meanwhile, her mother, Anna Ruth, was an elementary school teacher. Yellen was raised alongside her brother John. She enrolled at Fort Hamilton High School and then Pembroke College in Brown University, majoring in economics. She earned Ph.D. in economics from Yale University. She began her profession serving as an Assistant Professor of Department of Economics, Harvard University. Six years later, she switched to Massachusetts Institute of Technology as a research fellow. Further, she served at the Federal Reserve System as a Board of Governors in Trade and Financial Studies Section, Division of International Finance and Economist. After a year, she went on to serve as a Lecturer at London School of Economics and Political Science. Before being a member of Board of Governor of the Federal Reserve System, she worked at the University of California, first as Associate Professor and then Professor. In addition, she has worked as Chair President’s Council of Economic Advisers, and President as well as CEO of Federal Reserve Bank of San Francisco. Also, she has held positions as Vice Chair, Board of Governors as well as chair of Federal Reserve System. Moving into her personal life, Yellen is a happily married woman. She is married to George Akerlof, an economist. The couple together is blessed with a child, a son Robert Akerlof who teaches Economics at the University of Warwick. Yellen is American by nationality and she belongs to white ethnicity. Her current net worth is estimated to be around $13 million. Janet Yellen was born on 13th August 1946, in New York City’s Brooklyn borough. She is an American by nationality and she belongs to white ethnicity. Yellen started off her profession in the economic field, working as an Assistant Professor of Department of Economics, Harvard University. Later six years, she switched to Massachusetts Institute of Technology as a research fellow. Yellen tied the knot with George Akerlof, an economist. The couple together is blessed with a son, Robert Akerlof, who teaches Economics at the University of Warwick. As of 2018, Yellen current net worth is estimated to be around $13 million.With a tremendous net worth, Yellen is living a lavish lifestyle with her family. Yallen served four years as the Chair of the Board of Governors of the Federal Reserve System, from 2014 to 2018. Prior to this, she was President and Chief Executive Officer of the Federal Reserve Bank of San Francisco.